Happy Monday! Last week I guest blogged over at Creative Juice. Creative Juice is the fabulous site that is 'all things party'. My new bloggy friend Mindy and I arranged a swap- it was fun to post on another site. 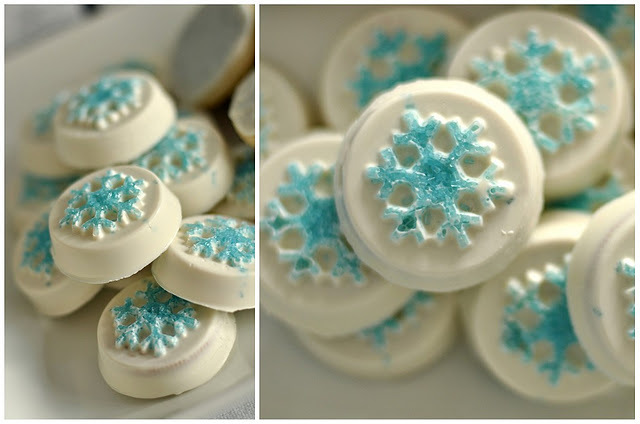 Didn't you just love the Candy Covered Oreo recipe she shared on Friday? That girl has some serious talent! So today I thought I would bring my craft from Creative Juice back here to share with you. And now that the kiddos are home from school and the days til Christmas are numbered, this is the perfect activity to keep hands busy and create some last minute gifts as well. When it comes to Christmas, there is nothing like handmade. Recently I ran across an idea on Pinterest that I just couldn't pass up. 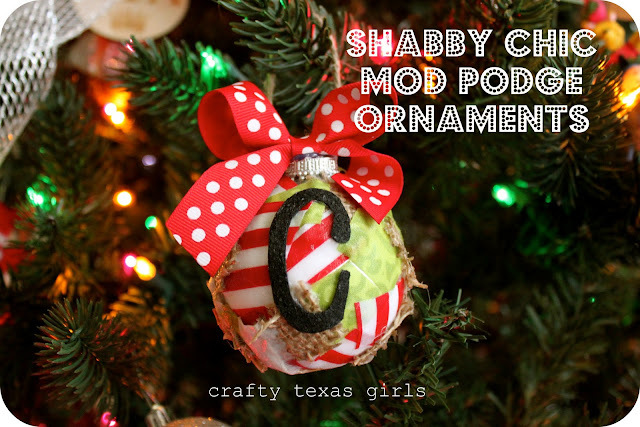 The craft is originally from "Sew to Speak" and their creative blog inspired me to create these "Shabby Chic Mod Podge Ornaments". I love this craft because they are the perfect gifts for friends/family, little hands can help too, and best of all- I bet you already have all the supplies needed! Next wait for the Mod Podge to dry. I was impatient, so I "painted" the entire ornament in one sitting. This meant that I couldn't lay it down because it was wet on all sides. 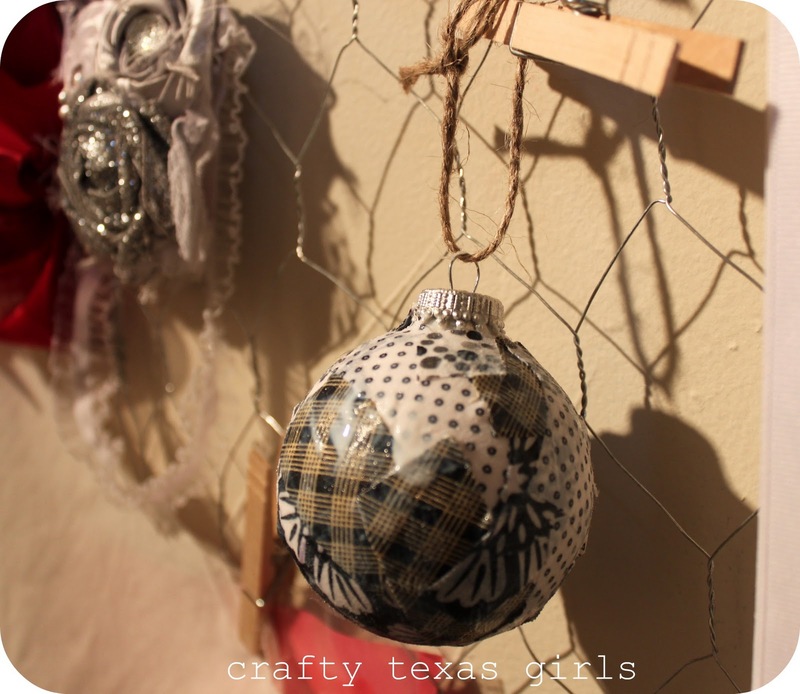 So I just used some jute twine to hang them from my chicken-wire inspiration board. They took about an hour to set. Once they are dry, the fun part begins-- embellishments! I removed the hook and hot glued the twine on top. This made more room for the bow. I like to add natural material to my crafts when possible. 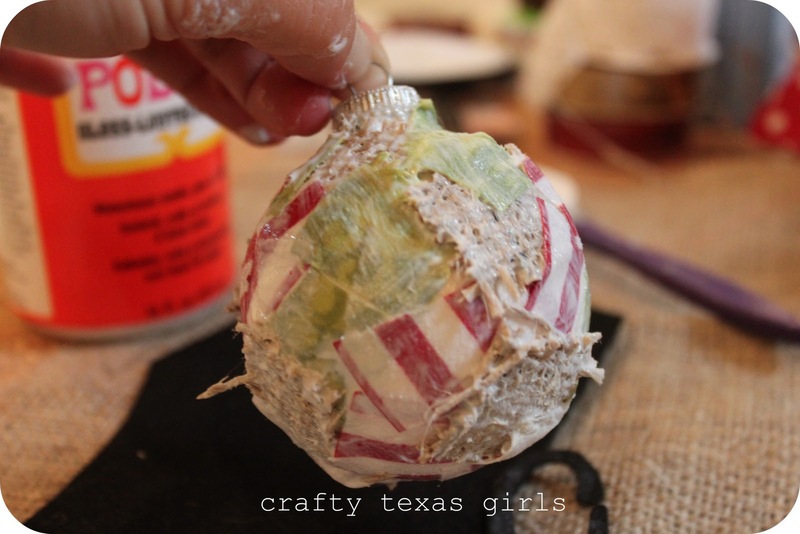 Make sure you hot glue the 'cap' onto the ornament because once you remove the hook, there is nothing to hold it on. Then I added buttons, ribbon, lace, felt, and jewels. I created three styles. Since I am using these as gifts, I wanted them to match the personalities and decor style of the sweet ladies who will be recieving them. I love how they turned out! And there are so many options for this craft. For a baby's first Christmas ornament, you could use fabric from the nursery. 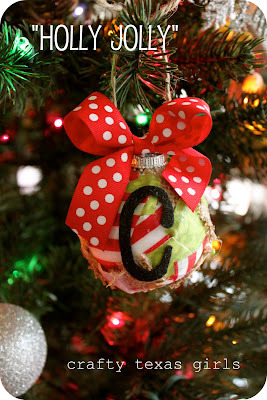 Or use the ornament as part of a wedding gift using fabric that coordinates with the bride's colors. Celebrate school spirit with an ornament made in your team's colors. Scour your fabric piles- look for unusual combinations or go for traditional red/green. 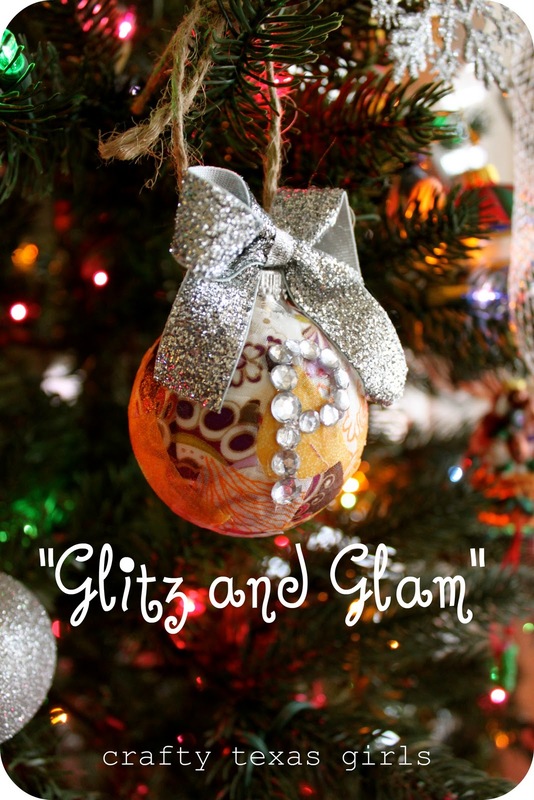 When it comes to these ornaments, you can't go wrong. Are you working on any last minute projects? I still need to make treats for my neighbors, any ideas??? Visiting from Home Stories A2Z, and when I saw "mod podge" in your title, I knew I couldn't pass this up! These ornaments are adorable...I'm on a burlap kick too, so I think I'll try one this afternoon with my girls. Thanks for the inspiration. 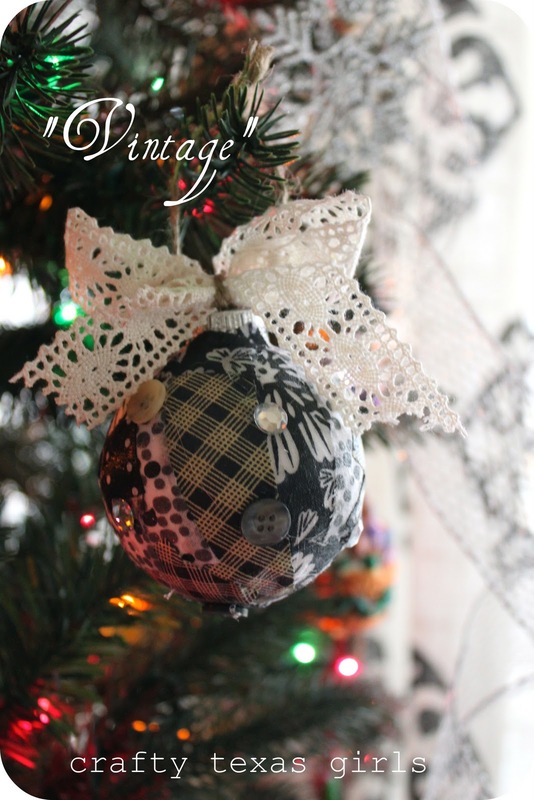 I LOVE those ornaments and I have tons of scraps! You will see those on my tree next year! Thanks for the tut! Thanks girls! You can't go wrong with a little Mod Podge! Merry Christmas!